Anthony Rizzo’s go-ahead solo home run ignited a five-run 11th inning to lift the Cubs to the victory. The Cubs scored all five runs off of reliever Matt Albers. It was the first time in 22 games that Josh Hader pitched in, that the Brewers failed to win. Corey Knebel and Jeremy Jeffress combined for 2 1/3 innings of scoreless relief before Albers came in to lose it. 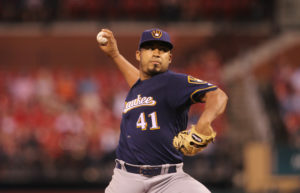 The Brewers got solo home runs from Eric Kratz and Jonathan Villar and a strong six-inning outing from Junior Guerra to give the Brewers a 2-1 lead. Junior Guerra worked a strong six innings before he was pulled for a pinch hitter in the seventh. The Brewers have now been outscored 36-11 by the Cubs this season and trail Chicago by a half game atop the NL Central. Game two of the series is tonight. Chase Anderson will get the nod for the Brewers.